Design and Develope a Fire Hydrant capable of withstanding unauthorized access. Fire hydrants are a pretty mundane ordinary devices that are truly unsung heroes. They sit on our streets in the rain, snow and god knows what, just waiting to perform they’re thankless duty. The Fire Hydrant is practically the same device that it was 50 years ago. There are several mildly different flavors but primarily they’re all the same. They also all possess one large issue in that they all have an inherent weakness. That weakness is the fact that they can be opened, misused and abused. Fireman in our cities witness this issue all too often. Unapproved hydrants opened in the summertime results in low water pressure, Hydrants with missing caps are unusable and can often become trash receptacles. Walking down the sidewalk passing a hydrant in dis repair surely gets unnoticed. However, a hydrant is disrepair can mean serious loss of property or much worse, a loss of life. Adept was approached by a retired New York City firefighter with an idea for a potential patent. A new style of fire hydrant that is “vandal proof”. There are many devices on the market capable of locking fire hydrants. However, most of these designs ignore on basic design requirement of the hydrant, ease and speed of opening. Locking a hydrant with a pad lock seriously violates this primary design requirement. The next obvious solution would be to design a special wrench that would be only available to the firefighter. Although, this inventor felt this would not be enough of a deterrent for a persistent hydrant vandal. From previous design attempts there was a plunger design that the inventor was very passionate about. To open the hydrant the firefighter would have to possess a tool that would depress a plunger with a large force to permit access. Additionally this plunger had a unique design making it very difficult to be tampered with. The design was favored but their previous engineer made an unbalanced and ill-conceived approach that led to its premature demise. Adept’s design incorporated a sprung rack, pinion and cam configuration. 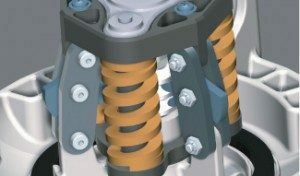 High strength die springs organized in a triangular pattern provided a balanced force. 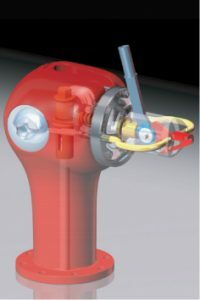 A rack and pinion arrangement translated the axial movement of the plunger to a radial rotation of three triangularly arranged cams that seated in the barrel of the hydrant. This arrangement provided a self-centering balanced combined axial and radial force with positive interference creating an impenetrable lock for the main barrel of the hydrant. 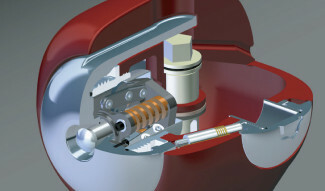 The unique and proprietary opening mechanism incorporated another levered cam that provided easy actuation for the firefighter to over-come the 1300 pounds of force required to open the hydrant. With the main barrel securely locked a method to secure the side ports was also required. This was accomplished by creating a dual spring plunger system that acted like a ratchet on the side caps. With the front cap secured the dual spring plungers locked the side caps. Once the main cap was removed the side caps could also be removed. 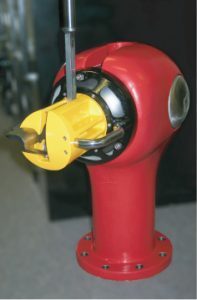 The dual spring plunger system also allowed for the side caps to be placed on the hydrant even if the main cap was on and locked. The caps were merely screwed on with a distinctive ratchet sound as they were tightened. Once tighten they were also locked. Conceptualize locking mechanism for 4.5 inch hydrant hydraulic port.